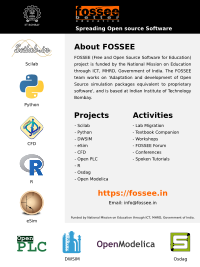 Details The FOSSEE (Free and Open Source Software for Education) project based at IIT Bombay conducted a two day workshop on DWSIM, an open source CAPE-OPEN compliant chemical process simulator, an alternative to Aspen Plus. It runs on Windows in native mode, and Linux and Mac OS X through Mono. DWSIM is useful to teach the Principles of Chemical Engineering. It is also useful to solve industrial problems. The workshop provided an opportunity to legally download for free, install and learn DWSIM.